Traveling across the South Korean countryside we were able to see farms and gardens tucked away in any available space and to start to process some of the tragic and amazing sites, smells and conversations that we had already seen. 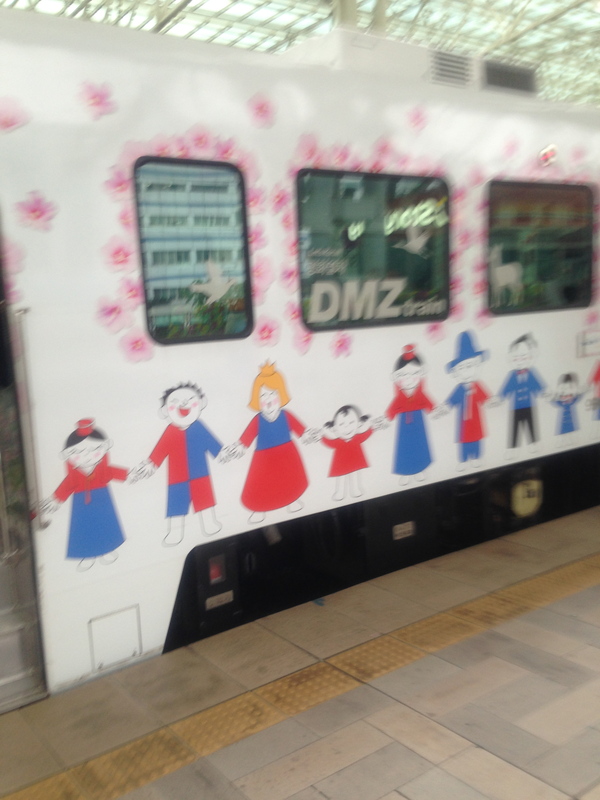 Our plan is to travel from the city of Daejeon to the capital of Seoul and meet up with some of our partners in the train station. Fortunately the announcer on the public address system shared information in English so we did could collect all our luggage and get off the train. We arrived at the end of the line about two hours after our departure and we missed our new friends Kurt and Hyeyoung who were behind us and preparing for the end of their first year with young adult volunteers, (YAV) but we were also anxious to see our partners in Seoul. As we moved up the escalator we were greeted by Pastor Pack and his associate Pastor Jonathan. It was so very good to see him again after the time he spent with us in Syracuse and working on Hurricane Sandy relief. A walk through the city was in order. We visited the largest book store in Korea and had lunch, and then wandered down the main street seeing statues of Admiral Yi Sun-shin and King Sejong the Great as well as visiting the Gyeongbokgung Palace. A gorgeous expanse under the mountain and beside the river so as to have the most benefit from the spirit of the earth. The palace was painted in the traditional colors of green and red and protected against the birds that would try to nest along the roof. After exploring some we headed out of Seoul and to the city of Goyang and our host church Ilsan Hosu. A test was upon us as we were separated into groups and a family would take us in for the evening. Language would be a struggle as none of us spoke Korean and most of our host families spoke only a little English, but food and a hot shower would cover a myriad of obstacles and pave the way for friendship and fellowship. This foundation would help us as we awoke on Sunday and returned to church and Sunday school, Morning worship, fellowship time, and afternoon worship. In the United States, we struggle for one hour to set aside for God and our partners in Korea spend six to eight hours on Sunday singing, praying and spending time in God’s Word. Later that evening we were able to relax and for perhaps the first time let off some steam. Our hosts put us up in a hotel for the evening and gave us a bout two hours of rest before dinner. It was for most of us the first time we were not vigilant at al of the social mores that in the United States are no longer politically correct. Our day was long and full of so many times of fellowship and fun. It was a great day to spend in Church and as the body of Christ, because even though we do not speak the same physical language, we are still serving and loved by the same God. Pray with me for energy and stamina as our students head toward the finish line. It is a wonderful experience but also a daunting one and we are so blessed to be in this place with people who care so much about us. Amen. In the book of Revelations there are several times when the people cry out to God. In each instance God answers. They are longing for an end to war and that the New Kingdom will begin. The echo over the years is a prayer for the peace of Jerusalem. Perhaps in our time we do not cry out to God enough, at all, or maybe we do not listen. In Jeremiah’s time the people closed their ears and eyes to the tragedy all around them. The war was at the front door and folks were unwilling to believe that the discipline that God had promised had finally arrived. Today this small group of Presbyterian American students traveled to a little known place; No Gun Ri Peace Park. While there we learned viscerally that war, any war is violent and ugly. This little park stands alone against the giants in our world and asks; who will take responsibility? They continue to point out the bruises and scars of our past, regardless of your ethnic background. The scars here are evident as you walk by and see the impact of bullets from over sixty years ago. The emotional trauma remains because everyday people are wounded by loved ones, strangers and their government. What will you do? It is a question asked by the director of the park who sat with this collection of youth and urged them to return to the international peace conference, or at the very least to live their lives for another. To not be selfish and insular but to strive to make a difference in the world around them was the charge issued to each of us. The morning was as heavy as the rain clouds pouring out their treasure upon the earth and then as lunch arrived we were greeted with the shining sun and much of the weight was lifted off as we visited the Korean traditional music museum. We were given a short lesson on playing a traditional drum and for many of us sitting cross legged on the floor with the drum between our feet was hard enough. We played and laughed and enjoyed our music even though we could not always cross the language barrier. The music did this for us, even sharing our thanks. These bookend experiences only magnified our exhaustion and excitement as we continued our second full day. One last experience was to help out in the soup kitchen. We worked and sweated with the regular workers and offered hospitality to the people who came for a hot meal, sometimes the only one for that day. This time was an exchange as we took some powerful lessons and then gave back in a very small way. Continue to pray for the health and strength of the delegation as we travel by train today and look for God in the faces of those around us. In the last few days it has become very apparent that the world around us is preparing for the winter coming. The fish we saw moving from the Lake into a more secure and safe body of water so that they might lay eggs and produce next years hatchlings told the story on one page, while the trees and the fruit they produce whether it be apples, cones, or berries marketing their produce so that the consumers will take the gift of fruit and scatter it far and wide on another. In each case the change is happening and we need to be prepared. In that direction that church is also moving. Change happens all around us and we are asked to meet the issues head on by some who desire us to take a stand on the environment or some political issue, while on the other hand there are those who simply want the church to bury its collective head in the sand and wait for the storm to pass. Both avenues have been explored by the church over the last two thousand years and in some cases have proved successful and in others they have failed. What is the church to do? There are two passages that come to mind when I think of these issues within the church. The first is in The Gospel according to Matthew where Jesus separates the sheep from the goats. There is no question of theology or polity but hospitality. Did you feed sheep, did you visit the sick and imprisoned? The answer determines on which side you find yourself. The second passage is from James, a letter often overlooked in the Church today. There are two verse in the first chapter which help us, I think, to navigate the troubled waters of today. The first is to be slow to speak and quick to listen (v.19) and the second is to look after the widows and orphans, which is a mandate that comes to us from out of the Hebrew Scriptures. (v.27) None of these verses ask us to be the body politic or to allow our faith and the Good News to become a matter debated in the marketplace or courts. Jesus asked us to go and spread good news through the entire world. We are the result of this journey which started with the few disciples who were in the upper room and present when Jesus Ascended. They started the journey in Jerusalem and spread out to Judea, all of Israel and finally to the world. Offering grace and mercy. Grace is not a tool of our economy and it is not able to be measured in a valid study or in market research it is about faith. Faith is is not science, or politics, it is raw and visceral and gut level and different for everyone who ever experiences it. God meets us where we are not where we should be or where we feel we ought. Where does God meet you? In the quiet of your home, the changing leaves in the park near your house, with friends around the lunch table? The times they are a changing but God remains. How will the Lord find you? The Quaker’s ask this question of each other as a greeting. Wondering out loud with each other how the Spirit of God was moving in and among the body of Christ. So I am asking you to think about the changes and the world around us and whether or not they are going to distract us from the calling that God has placed upon our lives; to go and spread good news, or will we become mired in the chaos of budget problems and closed governments, wars, famine and judicial wrangling? The church is at a crossroads in time so I will ask again; How is the Spirit with you?